The Waldorf salad may be over a century old, but even today; it remains a timeless American classic. 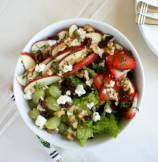 This apple and walnut salad has many variations served in restaurants all over the America, but original salad has red-skin apples, celery, walnuts, and mayo dressing. 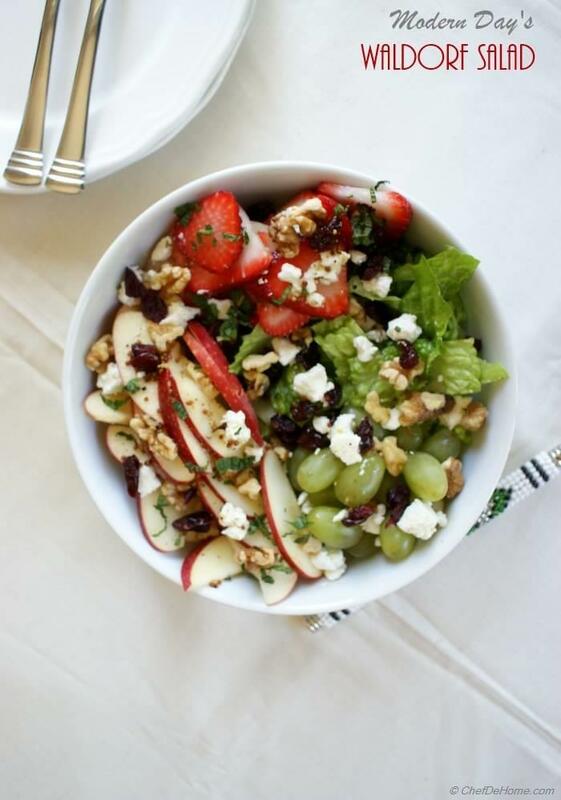 I am sharing with you modern days, healthy and lite - the Waldorf salad with traditional red-skin apples, seasonal fresh strawberries, grapes, tangy dots of goat cheese in lite lemon dressing. Little dots of creamy Goat Cheese have taken place of heavy mayo dressing, making this salad lite and healthy, less in calories, yet very elegant looking Waldorf salad. Look at it, don’t you think it look very pretty? So true, we eat with our eyes, looking at these salad pictures again making me hungry!! Many versions of Waldorf salad call for candied walnuts. I, however, used raw walnuts. Why? For one reason, i.e. toasting, candying, or frying increase saturated contents in raw nuts. When we planning to eat salad, why not celebrate the spirit of being healthy? If you planning to make Waldorf salad for a dinner party or weekend family meal, use oven toasted or candied walnuts for taste variation. Addition of cranberries makes this salad very festive looking to me. 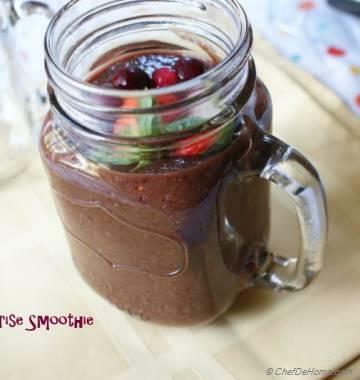 However, cranberries are totally optional. I am glad to share this American Classic salad with you all, updated to suit the modern healthy life-style. 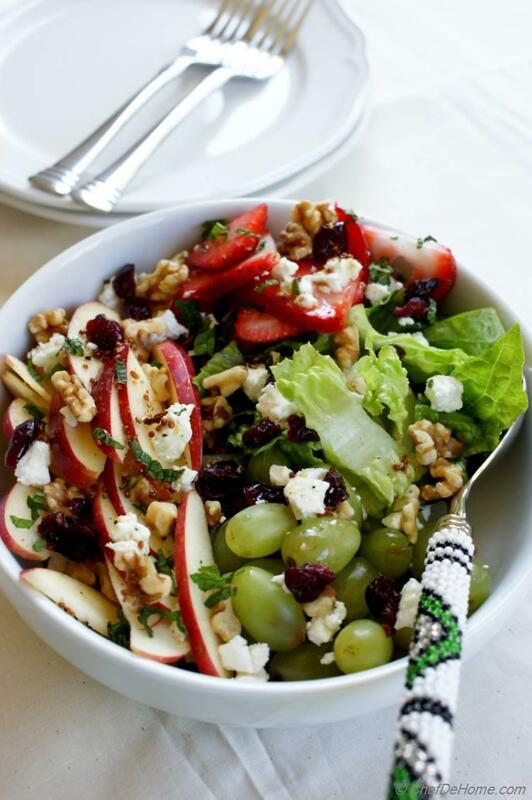 Waldorf salad is ideal for entertaining guests or for a dressed-up dinner with your family. 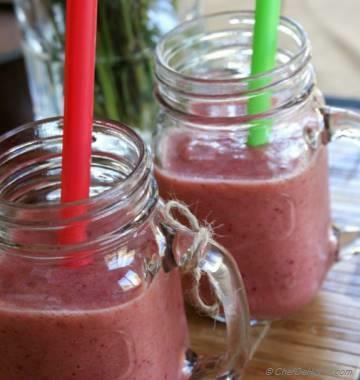 So, make some for family dinner this weekend and enjoy!! Total Time 10 minutes Prep Time 10 minutes Cook Time 0 minute Difficulty Easy Yields 4 Small Servings Serves 2 Notes Good for 2 large salad course or 4 small side salad servings. 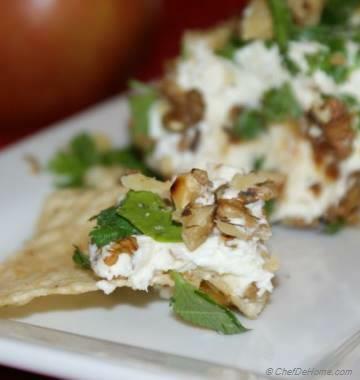 Smart Swap Replace Goat Cheese with Low Fat Yogurt to cut few more calories. 1. Vinaigrette - In a small bowl, combine olive oil, stone ground mustard, lemon juice, salt and black pepper to taste. Mix well and set aside. 2. Assemble and Serve - In large salad bowl, dice and arrange lettuce leaf at the bottom. Now, arrange sliced strawberries, thin sliced apples (skin on), grapes on the top. 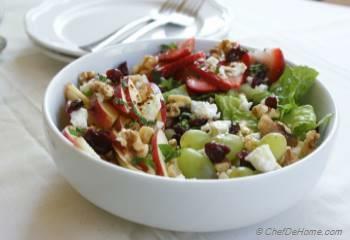 Top with dots of creamy goat cheese, walnuts, pepper flakes (if using) and cranberries. Drizzle vinaigrette on top and top it with some julienne mint, serve and enjoy!! Its that easy and simple!! Welcome to ChefDeHome new look! !